I do really hope this highly artistic drawing helps someone. I really hope there's someone who still reads this forum, because I've screwed myself quite royally in a KT-0405-R conversion. The instructions for removing the ADM202 state to "use a Dremel" as an option. Well, I got out the dremel, and ham-fistedly gouged out the pads that the chip used to sit on ...At least the chip is gone? What I need to do now is attempt to follow the broken traces to the other endpoint and solder there. 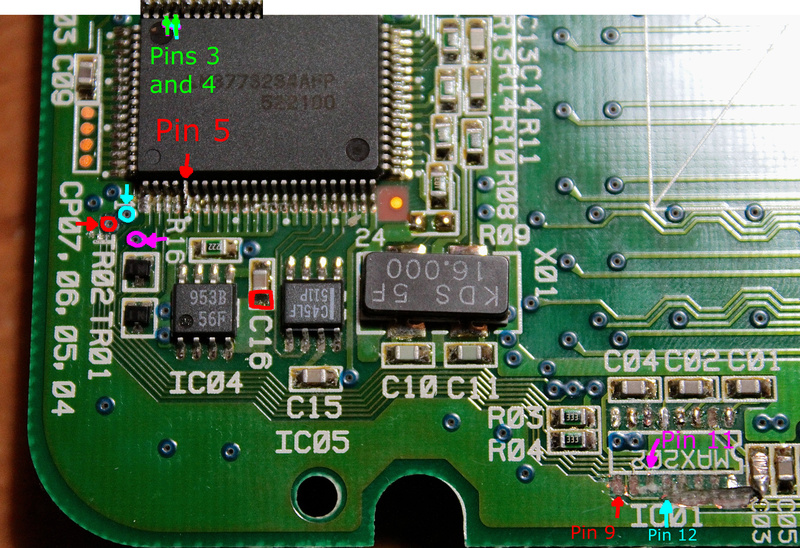 I managed to follow pin 9 back to the M377* chip (so I can ground it), but pins 11 and 12 I can't find the other endpoint. Or even the start point. I posted giant high-res photos on Flickr of the damaged area here, if anyone can take a look. I'm wondering if someone with another tablet - say, the UT- or GD-0405 - might have a similar layout that could give a hint. 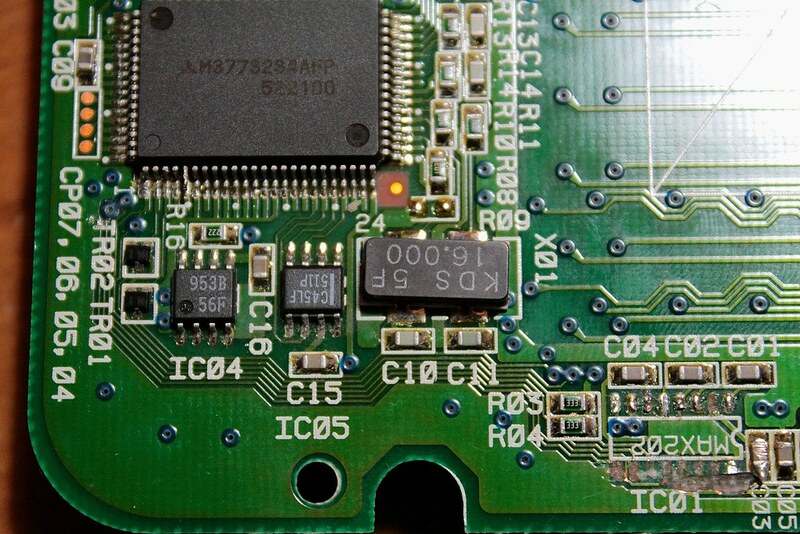 R03 and R04 are somewhat suspect, as well as any of the surrounding capacitors or the CP04, 05, 06, and 07 points. I concur! Try posting the images to the forum. I fixed it! The photos were actually invaluable in being able to follow the traces where they are supposed to go. 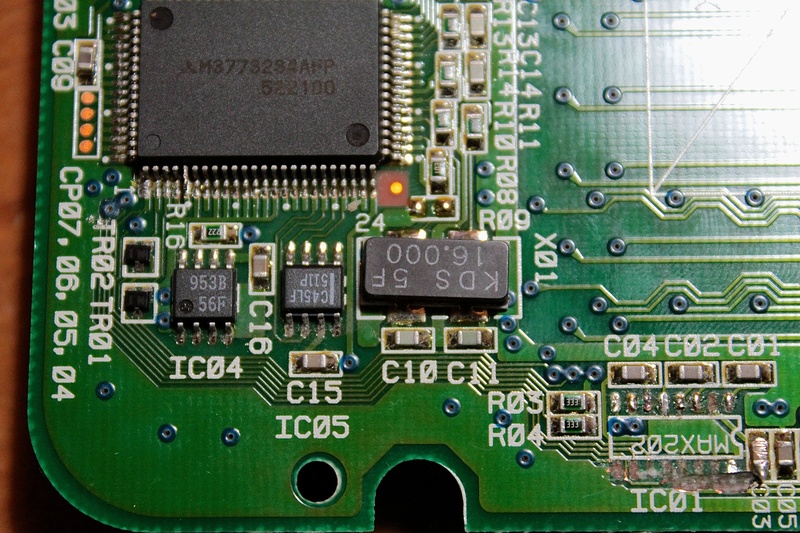 All three important pads lead back to the Motorola chip on the board. If you lift the pads removing the ADM202 pad, you can either solder to some test areas, or lift the legs on the chip and solder to that instead (what I did). Finally: there is no TR1R to remove/bridge on the KT-0405-R. I spent forever searching for this, then decided to connect it up anyway, and it worked fine. Here's a photo of my mod. I put the Teensy inside at the bottom-left corner. Had to cut some plastic to fit the USB port. I also drilled a hole for reprogram button. Covered both with electrical tape - everything fits snugly and closed up fine. The pen is a Samsung Galaxy Note S-Pen with eraser and button. Cheap off eBay if you need a replacement. Installed 6.20 drivers on OSX and burned the latest 0.15a WaxBee firmware. Now recognizes as an Intuos2 and GIMP handles everything! This project is awesome! You certainly did take a chunk out of the poor Wacom. Good job at fixing it, glad to hear you got it working.